Persuasive and Informative speech topics about politics. Only democracy stimulates to life real in liberty and to pursue happiness. Some democratic republics pretend they are democracies. Middle East peace efforts are worthless and media silence is the only way out. Political correctness kills freedom of speech and wheedles to oppression and no respect for human rights. A President should be able to serve for more than two terms if the people want her or him. Political funding committees should be more regulated. Quebec should become independent, but at what cost? Australia is not doing enough to help their indigenous population. Arnold Schwarzenegger was a good governor in California. Ban hate politicians from political campaigns. Celebrities: stay out of politics! Citizens who don’t participate in democratic processes should be forbidden to vote. Global leadership is not possible. Honesty and integrity are the most important qualities of an elected official. Only democratic nations should have a vote in the U.N. General Assembly. Parliamentary terms need to be limited. Political organizations should be forbidden at campuses. Politics was invented by people who wanted to be in charge. Power to the people is not reality in our democracy. Private campaign contributions for elections should be banned. Spin doctors are the rulers of political campaigns. Syria and Libya should be banned from the United Nations. The immunity of politicians in office must be abolished. There is a liberal bias in the media by highly educated journalists with a left-wing agenda. There is a new kind of colonialism between foreign politics. Trading with politically unstable nations is a gamble. Why -fill name here- is or was the best head of state. A wall on the USA/Mexico border could combat illegal immigration. Continue the war on drugs by attacking the ingredients needed for production. How influencing governmental decisions by lobbying really works. Tax havens like Liechtenstein, Luxembourg, and St Vincent and the Grenadines. How to calculate a solid retirement plan when you are still a student. The strategy of the UN to eliminate poverty. The education system (K-12 up to university) in Asia explained. The effect of the abortion laws on the number of illegal abortions performed. Congressional speaking times and limits. Elections for the House of Representatives. Hans Christian Andersen’s fairy tale “New Clothes of the King”, is still actual in today’s politics. How to become an MP or Senator. How to cope with unparliamentarily language. Political distinguishments between the terms FTO and liberation movement. Privileges of members of congress. Procedures and rules of the House of Chamber. Scandals and fighting in the house. The changing role of the African National Congress in modern South Africa. The classical Trias Political model. The division of executive power in the senatorial system. The function of the Speaker of the House. The life, career and works of former UN Chief Annan. The procedures for legislatorial debates. The role of congressional committees. The silent power of back benchers. Violence and terror during the Russian revolution. Ways to increase participation in the democratic process. 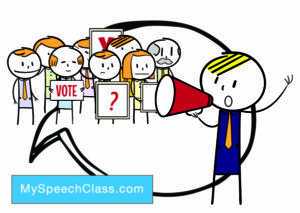 Cite this article as: Jim Peterson, "61 Politics Speech Topic Examples [Persuasive, Informative]," in My Speech Class, October 5, 2018, http://www.myspeechclass.com/politics-speech-topics.html.